She's got giant arm spikes and she's not afraid to use them. Nice blood you have there, shame if a space ninja came along to rip it all out of you and turn it into a shield. Hopefully you won't live long enough to see her turn your blood into a bomb that she uses to kill your friends. 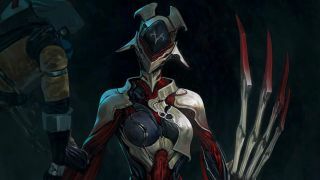 Garuda is surely the most violent Warframe Digital Extremes has created so far, but if you're going to create a blood mage archetype, there's got to be some blood. Garuda's '1' ability causes her to dart towards her target, literally rip them in half, and then form their blood into a square barrier that absorbs fire and charges the bomb. Press 1 again and she pulls down the deadly basketball-sized orb and throws it. If she holds down the button to charge it, the impact can send enemies within the impact zone flying. Garuda's ultimate summons a storm of blood spikes that rotate around her, sucking enemies in and dicing them up as she calmly floats along. The Digital Extremes reps showing off Garuda's abilities suggest that this skill might be tweaked to make Garuda walk menacingly forwards rather than passively float. Either way it messed up the poor Grineer enemies in the demo. Garuda's other two powers manage her health and energy reserves, but they are just as bloody as her offensive powers. Her '2' ability causes a bloody spike to thrust upwards out of the floor, impaling the targeted enemy. This grisly totem drains the target's health pool to heal Garuda and her allies within a circular radius. In action Garuda gives the impression of a cold, strutting killer that tears forward to brutalise enemies without warning—"regal" is the word Digital Extremes likes to use. She's still being tweaked, and the blood bomb throw effect looks like it's doing less damage than it really is, but there's a strong concept behind her vampiric moveset. Having said that, on the outset it's hard to see what she does better than any other Warframe. The rip-in-half looks like an instant kill, which is nice, and the heal offers some extra help in a team context. We'll have to see how her finalised stats look, and figure out how much damage that big ultimate can really do. Warframes aren't always about raw utility either. Playstyle matters, and dashing around tearing Grineer up does look like a lot of fun. If all goes to plan Garuda is due to arrive alongside the Fortuna update in early November.